Every person working in a commercial building, can bring up to 2.5 Kilograms of dirt, just on their feet, every year! This translates to tons of damaging abrasive material, potentially destroying surface finishes, such as timber, marble & granite floors, reducing the life of quality entrances. 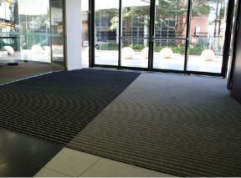 The RolaDek entrance mats are a highly engineered design, controlling this type of damage dramatically, strategically placed at major entrances, it acts a sacrificial surface, that can easily be refurbished or replaced. RolaDek entrance mats feature a sleek architectural appearance, perfect for use in high traffic zones. RolaDek entrance mats are custom fabricated to meet your specific requirements, are easy to clean, roll back 180 degrees and come with male and female edging for on-site trimming. RolaDek entrance mats have been found compliant to the GECA standard ‘GECA 25-2011 v2 Floor Coverings – GBCA recognised Level A’. This certification provides our consumers (or customers) with assurance that this product has been independently assessed and can be used in your next Green Star Project! So it makes sense – RolaDek entrance mats are rough, tough seen & green and are aesthetically pleasing.